← Should You Follow Your Heart? Can You Afford NOT To? In the 2000 film The Family Man, Jack Campbell (Nicholas Cage), a successful and talented businessman, is happily living his single and lavish life in New York City. From outward appearances, he has everything—or so he believes. One day he wakes up in a new life in New Jersey where he’s married to Kate (Téa Leoni) and has two kids. As the story unfolds, Jack discovers the power of love surpasses all the wealth and supermodels he used to enjoy. Because Jack is happy but confused, an earth-angel named Cash (Don Cheadle) explains that he is being given a “glimpse.” The glimpse is what could be—depending on Jack’s choices from this point forward. I love this movie and have seen it at least 5 times. It’s a powerful reminder of the beginning stages of our own spiritual journey. When we first step onto the spiritual path, it feels as though we are being lifted higher, almost effortlessly. Marianne Williamson once described the first steps of our spiritual excursion as “…being lifted to the top of the mountain.” From way up here we can feel the winds of love caressing our skin and see the rays of light illuminating the sky. Like falling in love, we are alive with excitement and anticipation. No longer asleep and dreaming in black and white, it’s as though we’re awake and witnessing everything in Technicolor. But as Marianne also explained, we don’t get to stay there. We must start at the bottom. And there are no short cuts. 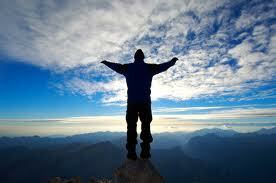 The top of the mountain is the preview and motivation that our higher self provides. How else could we possibly remain inspired when we slip or fall from the rubble of projections, resentments and negative patterns? I remember witnessing my own zenith of zeal 18 years ago. I could feel the heavy load from a lifetime of veils being lifted from my vision. Signs from the universe were everywhere; “random” coincidences in the form of billboards spoke to me, certain license plates affirmed a deeper truth and radio lyrics answered my deeper questions. I was positive that I was on a special “spiritual fast-track” and nothing was going to stop me. But a year later, the miraculous mission began slowing down. It didn’t stop but the effortless momentum definitely dwindled. At first, I didn’t realize that, like Jack, I had been given a glimpse of what could be. As I continued my trek into the light, I began to understand that in order to sustain the pinnacle of joy I would have to acquire a lifelong practice of dropping my judgment, forgiving old resentments and facing some very tenacious dragons. My daughter, Alexis, is getting a glimpse of the summit right now. She is experiencing universal synchronicities daily and tasting the divine elixir of BEING AWAKE. Like young Tabitha in the TV series “Bewitched,” Alexis is beginning to harness her inner power and cast her spells of healing, love and light. So what’s the point of this blog? Thank you for that! I loved that movie too. Just recently I have been eperiencing the joy of being in alignment with spirit…exisiting in my truth. The synchronicities are amazing. It is a comfort to know that there are kindred spirits out there. Also, to understand that this sense of freedom and divine connection may waver but it doesn’t mean it is gone.forever. Thank you, Robin, for your insightful response. Knowing that we are walking this path together and can provide support when needed is comforting. Thank you, Laura, for a beautifully written piece. There is nothing like the joy and peace that accompanies times of “being in the flow”. I will now use the words “remember the glimpse” to encourage more self-reflection when my life feels out of sync. Oh yes, Judita–the “OFG’s” (opportunity for growth) we talked so much about at the Circle–is right up there with “Remember the Glimpse.” Thank you for taking the time to read the blog and to lovingly comment on it.